It's a bit late to the party, and there remain some wrinkles to be ironed out, but the city at long last embraces an idea that will make life here just a little bit better. At long last, Portlanders will be able to walk up to a food truck this summer and grab a hamburger, taco, hand pie, cup of coffee or other casual fare – years after the food truck revolution invaded other cities across the country. The presence of a few food trucks downtown (see this comprehensive guide to the fleet) will be a huge step forward for this food-loving city, which struggled over the regulations and made the whole process way more complicated than it needed to be. We should celebrate the fact that the city has finally embraced an idea that will make life here just a little bit better. 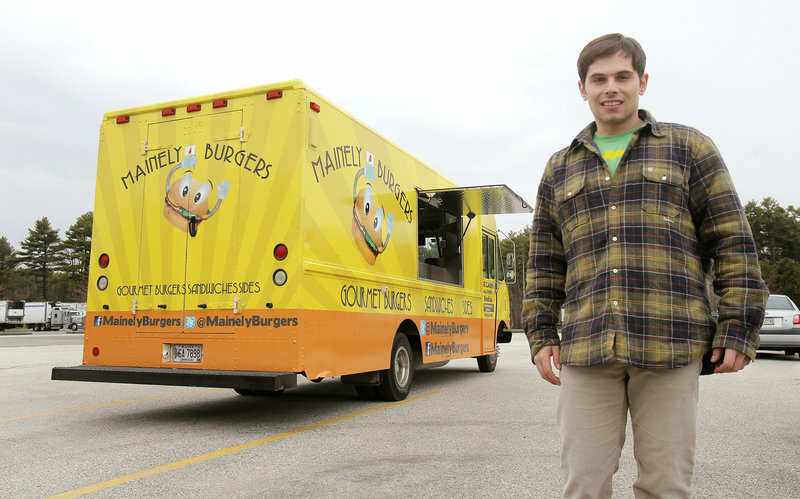 Who’s in the food truck fleet? But don’t crack open the Champagne too fast. When food truck operators actually went to get their licenses and open their businesses, they got a couple of unwelcome surprises. Turns out there are still two big regulatory hurdles to get over before we can declare Portland a food truck-friendly place. This means that some trucks will have to limit where they can do business, since all those fees add up quickly. But food trucks are supposed to be mobile, right? That’s the whole point. This is important because, truck operators say, in order to make their business work at all they must have a place to park on private property. There just are not enough public parking spots available on city streets because of the restrictive limits that were put in place to spare Portland’s restaurants a little competition. The second issue has to do with clustering. When the ordinance was being developed, food truck operators made it clear they wanted to be able to cluster together in a parking lot, especially for specific events. 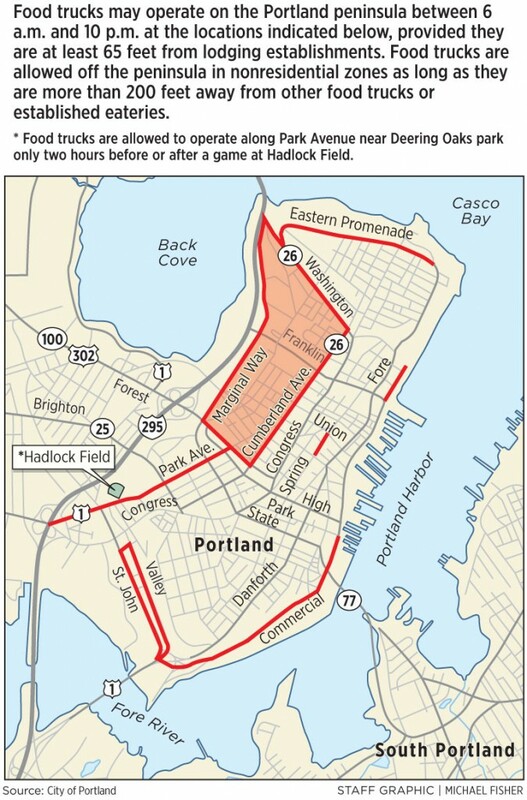 But when the regulations were published, the rules said food trucks had to stay at least 65 feet from each other on the Portland peninsula, and 200 feet away from each other off-peninsula. That hasn’t kept some trucks from clustering anyway, at the popular monthly “Flea Bites” gatherings at the Portland Flea-For-All on Kennebec Street, for example. But they are always looking over their shoulders while they’re selling their sandwiches, worried that these popular events will be broken up by the city because of a rule that they didn’t expect to be in the ordinance in the first place. The rule raises a lot of questions: Who pays the building and occupancy fees when these trucks cluster at an event? The property owner, since there are several trucks involved? Does each truck pay a separate fee, or do they all chip in together and pay once? And do they have to buy a new permit every time they gather, even if it’s a regular weekly or monthly event? The situation is clearly making food truck owners unhappy, but most are limiting their public comments to low-level grumbling, both because they still have to work with the city and are hoping someone in power will take notice and help them fix things. Clegg said the permits are required because the food trucks are being treated like tents and other temporary structures you might set up on your property for a special event. Sutton said the loose coalition of food truck owners that has formed in Portland has been trying to get the permits and the clustering issue brought up as an immediate concern at City Council for weeks, “and it hasn’t happened yet.” She just found out that Christopher Hall, CEO of the Portland Regional Chamber, will be meeting with the mayor soon to discuss these two issues. These glitches could just be considered a learning curve for the city, but they also point to larger concerns that Portland is making it too difficult for food trucks to work here. 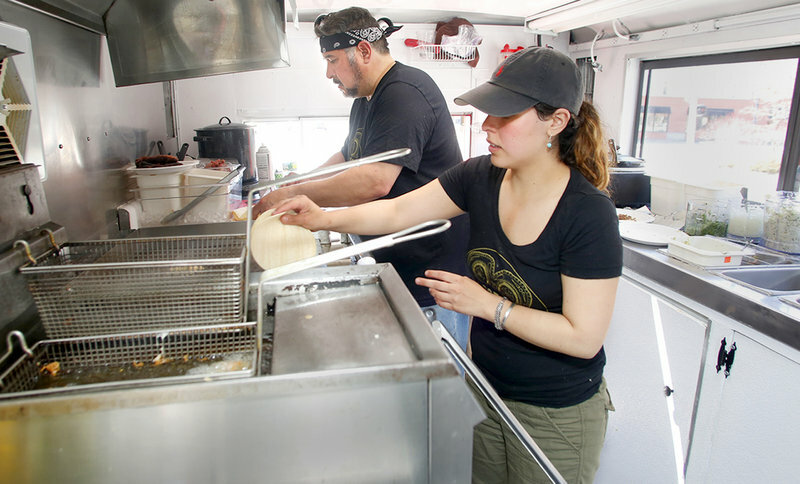 Jim Chamoff, owner of Gusto’s Italian Food Truck, has been running his business since December and has already found it difficult to work within the city’s rules. Chamoff tried leasing a spot in a private parking lot, but discovered quickly that he wasn’t going to be doing much business there. So he moved, and everywhere he moves, he has to get a new building permit. 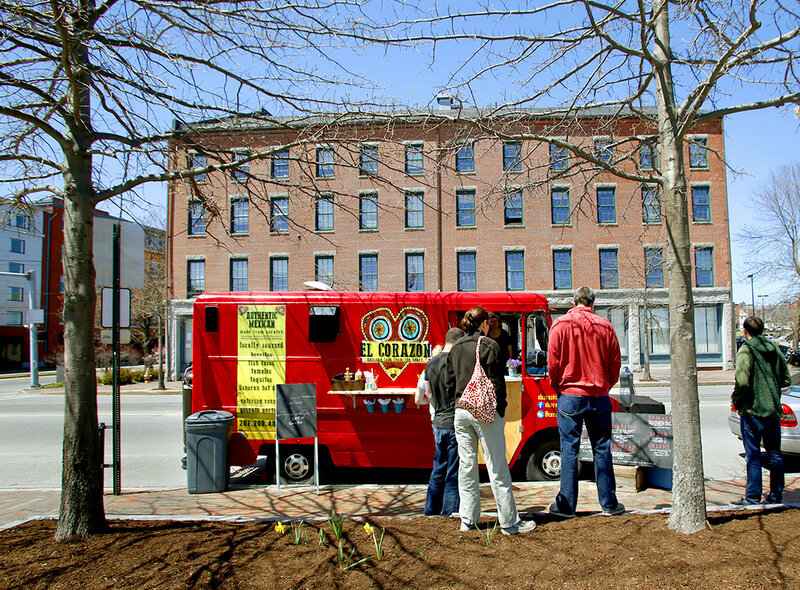 When he has parked on city streets, Chamoff has found it difficult to abide by the parking regulations for food trucks. Moving every couple of hours is not always practical in a big food truck that has to be set up and taken down every time it moves. The rules are supposed to be reviewed again in August, a year after they were put in place. Sutton said she hopes that once more people start food truck businesses here, there will be a stronger voice for the movement in the city. Because if things don’t change, don’t forget: Food trucks are mobile, and they may just motor right out of here.